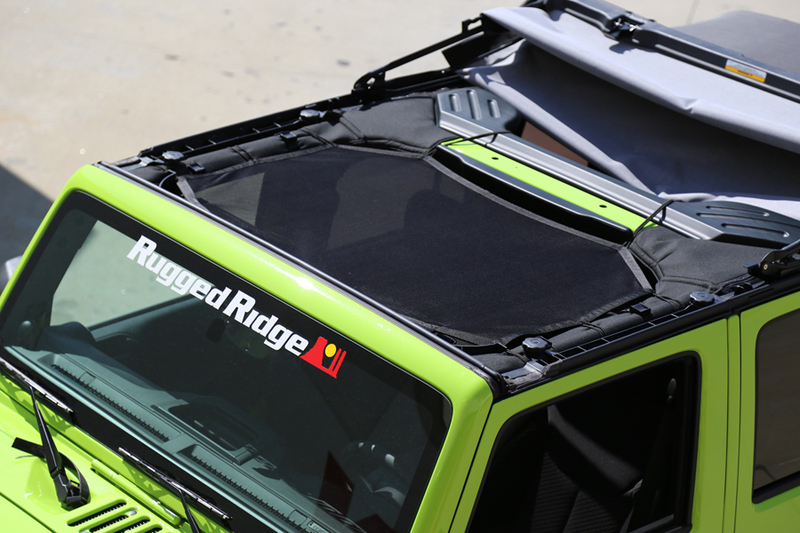 Suwanee, Ga. (July 16, 2013) – Rugged Ridge today announced the availability of its new Eclipse Sun Shade, built for 2-door and 4-door Jeep® Wrangler JK’s from 2007 – 2013. Designed to provide an open air-experience while shielding passengers from harsh sunlight, the Eclipse Sun Shade features reinforced mesh construction. The sun shade installs between the front portion of a JK’s sport bar and windshield, giving both the driver and passenger a “top down” feeling, while providing added protection from the sun. Rugged Ridge’s new Eclipse Sun Shade shields the driver and passenger while still providing a top-down feeling. The Eclipse Sun Shade is an all-in-one package that’s simple to install and doesn’t require any major modifications. By retaining access to the Jeep’s top clamps, drivers can keep the shade in place and preserve function of the factory top. “We developed this product because customers were asking for a summer top that was easy to install and remove,” said Henk Van Dongen, Director of Marketing at Omix-ADA. “By using the mesh material with built-in elastic straps, the Eclipse Sun Shade was designed from the start to eliminate the need for a header channel as with other similar products. The Eclipse Sun Shade installs with built-in bungee cords and a small mesh carrying bag for storage when not in use. 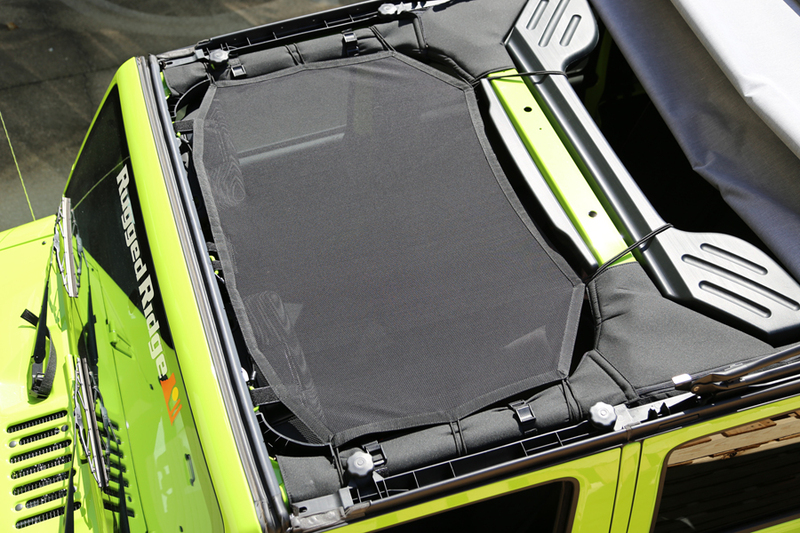 Compact in size, the Rugged Ridge sun shade can be stored in just about any compartment of a Jeep for quick access. Rugged Ridge’s Eclipse Sun Shade (Part Number 13579.04) is available online and through select Jeep and off-road parts/accessories retailers nationwide starting at $59.99. For more information on Rugged Ridge’s complete line of high-quality Jeep and off-road products, or to find an approved retailer, please contact Rugged Ridge at (770) 614-6101 or visit the company’s website atwww.RuggedRidge.com. Omix-ADA®, Inc. is the world’s largest independent manufacturer and wholesaler of Jeep®, truck and off-road parts, accessories and floor liners. For nearly two decades, Omix-ADA has designed, tested and manufactured more than 16,000 of the highest quality restoration and replacement parts and accessories. The Omix-ADA family of brands, Rugged Ridge®, Alloy USA®, Outland® and Precision Gear® are distributed throughout the USA and in more than 50 countries worldwide. For more information, please call Omix-ADA, headquartered in Suwanee, GA at 770-614-6101 or visit www.omix-ada.com.